During the 2018 breeding season (February-August), 67 dedicated SFBBO volunteers spent 912 hours monitoring a total of 62 potential waterbird colonies across 52 sites, 52 of which became active breeding colonies. ​We monitored 17 gull, tern and shorebird colonies and 35 heron, egret and cormorant colonies. Figure 1. 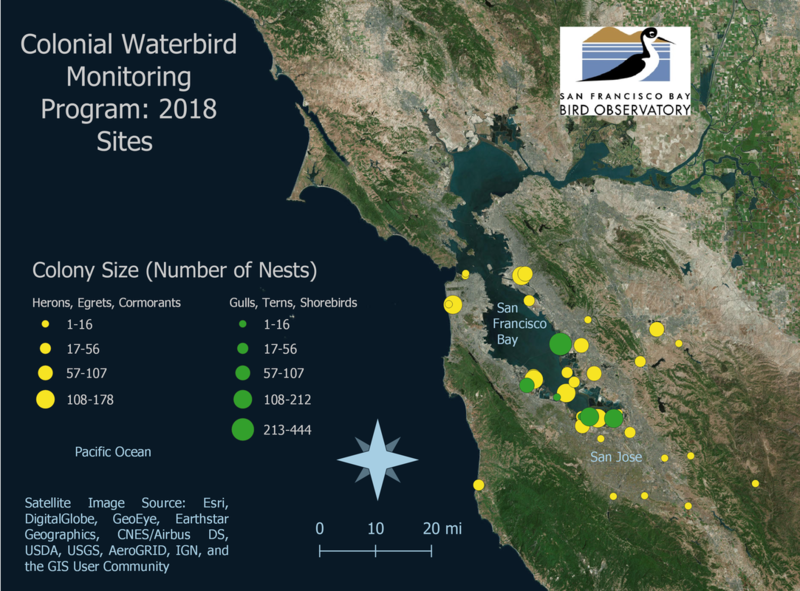 Map of 2018 Colonial Waterbird colonies and peak nest counts in San Francisco Bay, CA. Circle sizes indicate peak nest counts for our target species groups. Counts are based on observational methods, and do not include data collected during California Gull walkthroughs. California Gulls are the most abundant nesting waterbird in the South San Francisco Bay and SFBBO has been monitoring the growth of the breeding population since 1980. In 2018, SFBBO monitored 10 California Gull colonies via walkthrough surveys from May 9–15. These 10 colonies encompass all known South Bay breeding locations of this species. Figure 2. 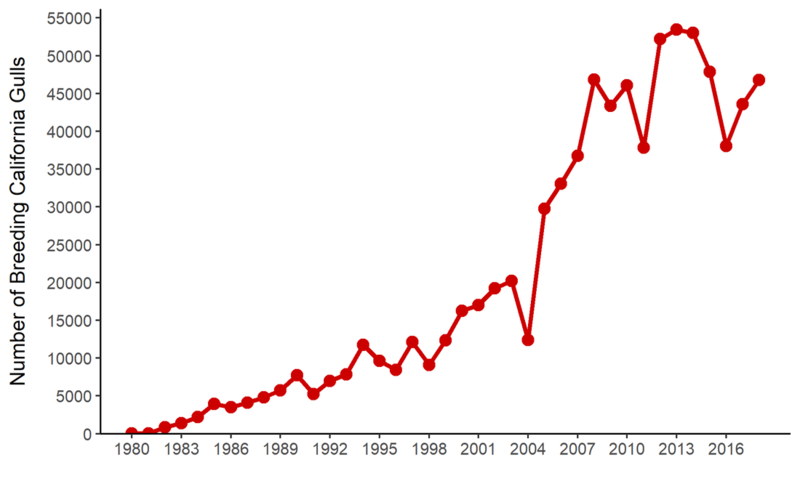 Estimated number of breeding California Gulls in the South San Francisco Bay, CA from 1980-2018. Figure 3. Percentage of breeding California Gulls within each colony site, 1980-2018, South San Francisco Bay, CA. PAFCB = Palo Alto Flood Control Basin. Alviso A6 provided dry habitat suitable for nesting gulls until 2010 when the levees were breached and the site was opened to tidal action. Following the loss of Alviso A6 as suitable nesting habitat, gulls redistributed to other nesting sites in the South Bay.